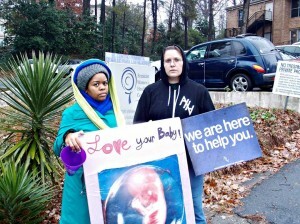 ATLANTA — A post-abortive mother from the Atlanta, Georgia-area recently repented and believed the Gospel after approaching two sidewalk counselors at a local abortion facility to ask if God could forgive her for ending her child’s life. On Saturday, as Zandra Westenkirchner and Britani Anthony of the Abolitionist Society of Georgia stood ready to minister to women outside of Feminist Women’s Center in Atlanta, a woman drove up in her van to ask a question. Westenkirchner then explained that while she could not provide medical advice, many women do have difficulty becoming pregnant following an abortion. “Is there any way I can ask [God] to forgive me for doing this?” Brittany asked. “Yes!” exclaimed Westenkirchner and Anthony. Brittany explained that she had just brought her friend to the Feminist Women’s Center for her fourth abortion, and was feeling a lot of guilt and regret over her own abortion. She parked the vehicle and came back minutes later to speak to the Christians. But Brittany said that after she had the abortion, she immediately felt regret. Brittany explained that she began taking pills following her abortion as a way to cope with the emotional and mental pain, but became addicted to the drugs. When her mother told her that she could see the change in her, she confessed that she had an abortion and was taking pills as a coping mechanism. However, the guilt and pain remained—which is why she sought out the women when she saw them standing outside Feminist Women’s Center. Westenkirchner and Anthony prayed with Brittany, who expressed her thankfulness for the Christians being there to care for her. They exchanged contact information, and Brittany later called Westenkirchner to talk further. Westenkirchner continued sharing the Gospel with Brittany, who repented and surrendered her life to Christ over the phone.